Pradhan Mantri Jan Arogya Yojana rolls out Sunday. Express does a ground check. Framed against the Aravalli mountains, the Shaheed Hassan Khan Mewati (SHKM) Government Medical College in Nalhar is just six years old, with 500 beds, all neat and well-maintained. Just 30 km to the south is the Community Health Centre (CHC) in Ferozepur Jhirka, a shabby one-room temporary facility in a dilapidated building. 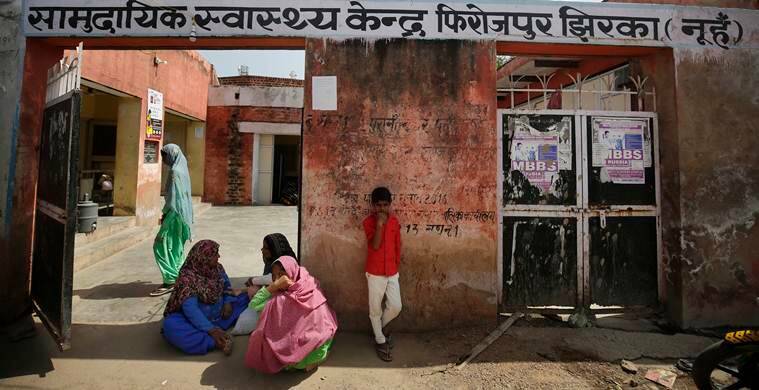 The gulf between the two represents the biggest challenge that confronts the public healthcare system in India’s most backward district, Mewat (Nuh), as it prepares to join the national rollout of the Pradhan Mantri Jan Arogya Yojana (PMJAY) on September 23. At SHKM, liaison staff are busy running last-minute trials for the world’s largest initiative of its kind that will provide an annual health cover of Rs 5 lakh to 50 crore people in 26 states. SHKM is one of the two government hospitals in this Haryana district to be part of the first rollout. At the CHC in Ferozepur Jhirka, meanwhile, the staff are relieved that they have at least a temporary facility to operate from. They had to move out of another crumbling building last year after it was “condemned” by officials. The CHC is the key link on the ground, referring patients up the chain to benefit from PMJAY. “We were given training for a day in Panchkula, and have since been acclimatising ourselves with the software. 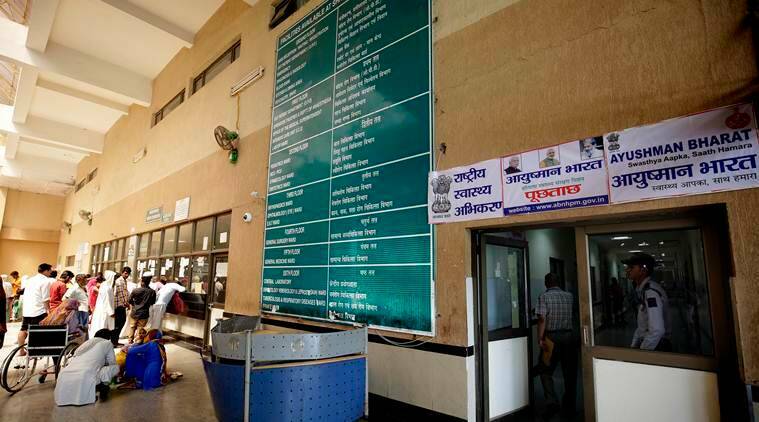 We have already had some curious people walk in with enquiries,” says Pramod Singh, one of the four Ayushman Mitras, or liaison staff, manning the kiosk at SHKM. “The dry runs are important because from next week only one person will man the kiosk at a given time. the kiosk will run 24×7,” he says. As The Indian Express reported Friday, 4.58 lakh people or around 57,370 families out of a total population of 11 lakh in Mewat are eligible for PMJAY. The beneficiaries, identified from the Socio Economic Caste Census (SECC) 2011, get “gold cards” in the form of bar-coded paper receipts, which entitle them to reimbursements for medicine, treatment and facilities (see box below). SHKM has received a list of 1,350 treatment packages for which reimbursement will be provided to beneficiaries. And medical college director Dr Yamini is confident that they will be “ready to roll out the scheme by Sunday”. “All our hardware is in place. We have told attendants to check the documents of all patients to verify their eligibility for the scheme. All our services, except MRI and CT scan, are free. We will now get reimbursed for various treatment packages, surgeries,” she says. According to a senior administrative official at the hospital, who did not wish to be identified, the reimbursement received under PMJAY will go the Patient Safety Fund. 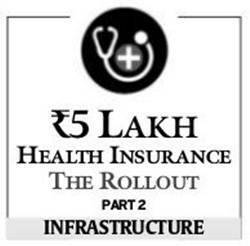 “Currently, we charge Rs 10 as a one-time registration fee that also goes into the Patient Safety Fund. When we start getting paid for patient care, we can get so much work done at the hospital. We can make our services better, offer more to patients,” says the official. “Right now, we have to charge patients for MRI and CT scan because they are being offered under the public-private partnership model. 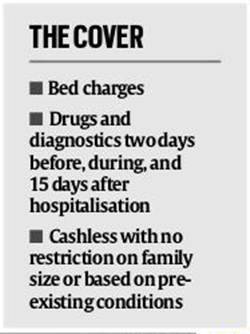 MRI charges range from Rs 1,800 to Rs 8,000 and CT scan from Rs 800-Rs 7,000. This is 30 per cent less than the market cost. All the tests are free for BPL patients,” says another administration official. The National Health Agency (NHA) has made it clear that PMJAY beneficiaries should be given priority “to the extent possible”. Since the scheme covers drugs and diagnostic expenses two days before, during and 15 days after hospitalisation, there will also be a need to tie-up at a later stage with local pharmacies and laboratories, say officials at NHA. “This is not yet a priority,” says Dr Renu Sharma, district nodal officer for PMJAY, who is still caught up in empanelling private hospitals. But far from all the buzz, the mood at the CHC in Ferozepur Jhirka is sombre. “We used to offer all facilities, even casualty services, before the building from where we worked was closed down. Now, there is no space for anything. We rented this small place from the municipality. We don’t have any specialists, or even a permanent lab technician after the last staffer at that post passed away last year. Now, a technician is deputed once every month by the civil hospital 8-10 km away,” says Param Bala, the nurse. Currently, services at the centre, which caters to 3,73,000 people in 188 villages, are limited to reproductive and child care and a handful of OPDs. “We received a list of PMJAY beneficiaries from the Block Development Officer to be verified by the ASHA worker. But we are not part of the implementation phase of the scheme,” says Dr Krishan Kumar, senior medical officer. And yet, the role that such CHCs play at the ground level is evident from the beaming face of Yogesh Singh, who walks in with his wife Anshu and their newborn son. “The delivery happened in Rajasthan, but I wanted to convey the good news to the staff here. After all, they took care of Anshu through her pregnancy,” says Singh, a resident of Ferozepur Jhirka. “Also, I want to ask about the new government health scheme that gets you Rs 6,000 after childbirth,” he says.